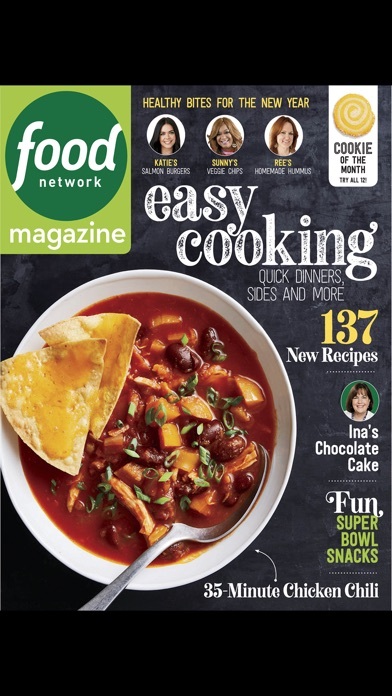 I've been subscribed to the digital and print versions of Food Network Magazine for more than two years and thoroughly enjoyed the digital version app that allowed me easy electronic access to all the recipes and articles. I would have given it five stars. The app was updated about a year ago and I had to phone Customer Service twice to get my subscription reinstated. The page view that had scrolled across the bottom of the page was particularly useful, and that's gone. I found this update clumsy and uniquely NOT user-friendly. About three months ago, the App was again updated to resemble the original. I’m much happier. Can’t open the issue I just bought? I wish I would’ve read the reviews before I purchased an issue. I purchased for $4.99 and then it appeared it was downloading but I can’t open it or read it? Am I doing something wrong or is it because the app is horrible? I just came back to the after about a year. Have to unlock an issue before you can leave a bookmark (how is that done, by the way? ), no list of issues owned - have to scroll through everything to which ones say ‘available offline’. This makes it almost worth it taking up space on bookshelves or magazine racks & going back to the physical issues. Please fix the app & put it back the way it was. ETA: have no idea how to find the bookmarks on my older issues from before the update. After my digital subscription expires, I will not renew. After the app changed a few years ago, it has been nothing but one problem after another. Very disappointing. I can’t even read any of the recent issues because the pages don’t TURN. Another poorly working food magazine app. Pages take forever to load and scrolling is difficult. I will be making an attempt to cancel my subscription. I’ve subscribed for years, and really like the magazine... But I can’t even open new issues since the update. I’m going to have to cancel. So I did the latest update, now I just owe for some of the magazines...what a joke Bring back the old format! Did the update and now it tells me I owe for each magazine or buy a subscription, which I already have!! No one responded to my email and no phone number. I'm done! Just cancelled! I agree with zero stars! New “improvements “ have basically made this app useless. I plan to cancel my subscription today. Yeah, so where’s our January 2018 issue? It’s already 01/08 and still nothing! Agreed with previous reviews about the app update being garbage. I actually thought it might be my iPhone or iPad that was acting up but glad to know it was the shoddy tech. Mostly...WHERE THE HELL IS MY JANUARY ISSUE? 02/18: So, just downloaded March’s issue and I can’t read it because I can’t turn the page. I try to swipe left and it just brings me right back to the cover page. After updating I can’t view a single page! I tried to troubleshoot but was told I needed an active subscription. I do have an active subscription. Tried to re-login but forgot my password and there is no option to retrieve or reset it. Cancelling. Horrible app! Each page downloads individually? Are we being watched as we read? And the borders across the top? Why? I move them out of the way and they come right back. A five-year-old could have designed this better. No offense to five-year-olds. There are too many partial and full black pages - and I gave up my paper copy for this. Please fix this. Love this issue of food network magazine. I especially like the sugared ginger recipe. Compared to buying the sugared ginger which only comes with a few pieces, I can do a whole pound at once. 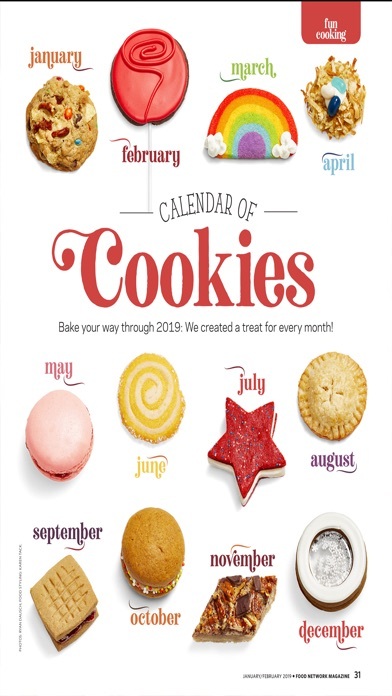 So not only are there great recipes, but there are money saving recipes as well! Thank You Food Network magazine!!! Apparently there is a problem since the 8.1 update. The magazine now crashes immediately after opening it. Hands down my all time favorite magazine !! 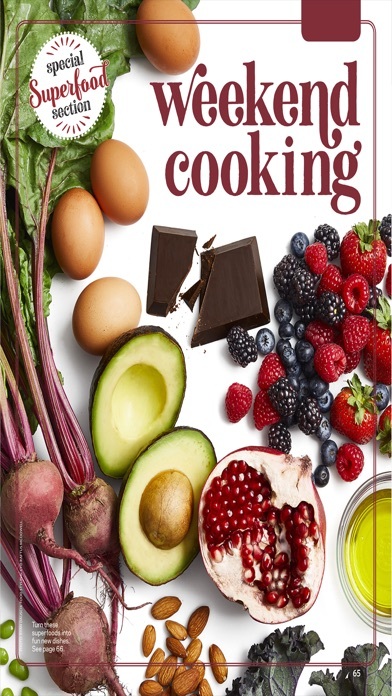 Great recipes and tips. I love my Food Network Magazine! Lots of ideas and, of course, lots of recipes. I tend not to put too many restrictions in my diet, even though I'm a diabetic, (balance in everything, right?) but I can always find something healthy to try amidst the tons of recipes! Please, Please, add a function for book marks. This app is very hard to navigate and when I want to save a page to go back to read it later it can't be done. Egg in ham said Sam! What a great way to use leftover Easter Ham! I have been watching Food Network for awhile and finally ordered the magazine. I am a tech junkie who hates clutter so having everything on my IPAD is great. I love to cook but I don't have any knowledge. This helps me create great meals for my family with a ton of variety. Want to view magazine in landscape mode! Can only view this magazine in portrait mode. Very nicely organized, easy to use & oh so yummy ! Highly recommend. I love this issue & every food network magazine issue, I think my favorite in every issue is the editors note she's personable in every issue. I only wish I didn't have to wait until March for another issue. I hate there not being an issue not dedicated to February. Makes me sad knowing when I'm looking at the new January issue, it will be another sixty days until the next one. I just subscribed and love the magazine. I'm a new "foodie" and have fun learning more in the kitchen with this. I like being able to view recipes on the screen, create a shopping list, and bookmark pages. My only request right now would be to integrate this with the Kitchen app that has a recipe box from Food Network. Currently you have to bounce around and the apps don't work together for saving recipes. A bit difficult. 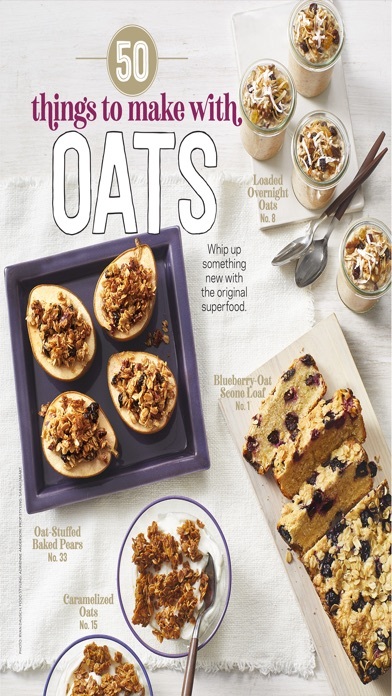 Make it we can add recipes from the magazine to get our recipe box. I was a bit skeptical to give up my print edition for just an online subscription, but I am loving all the the little extras I can. Like create a grocery list from a recipe or flag a recipe to try later. I love my books, but this has been really fun to explore the online advantages. So far I can't find anything wrong. I had this app for some time and was using it fine until the last two months or so. It was having problems so I deleted it and went to reinstall it. I can barely get it to download (takes about 10 tries) and when I do it won't restore my issues. The circle goes around once or twice and then disappears. Have contacted Hearst and they suggested it was a problem with my iPad. Umm, I can't even download your app. I don't think this is my problem. Please fix ASAP cause right now I'm paying for a subscription I can't use. Great App...Much improved from previous versions. Quick issue load. Very easy to navigate. One of the best magazine apps I have tried. It was more fun stepping on a Lego. Bought a subscription for the mag. Wasn't aware there was an online/app as well. Got the app. Password that they have me doesn't work. App freezes up my phone. Nothing about this app has been a pleasure. 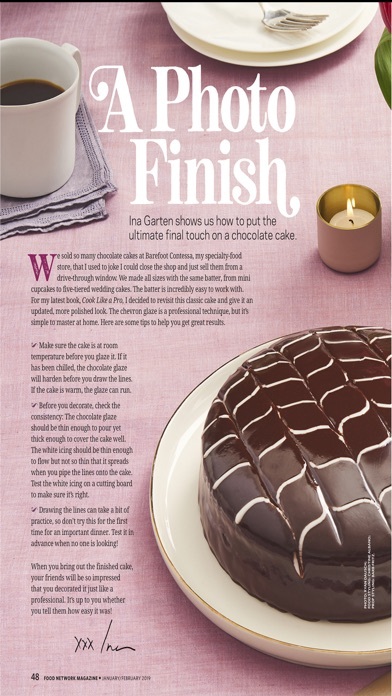 Food Network magazine is great in print form but the app brings the ultimate online and offline interactivity! Great ideas and Great recipes! Love my Food Network magazine! Great recipes, tips and articles! Look forward to my new issues and absolutely love this format! What happened to skipping straight to the page from the Recipes Contents pages? Great App for an Absolutely Great Magazine! It is rare that I like an electronic version of something as well or better than it's print counterpart. This is an exception! Beautifully well done! This app is more hassle then it is worth! I love the magazine but hate the clutter. I thought this would be a good alternative but I have to delete. and re-install the app every time I want to download the new issue. I prefer everyday recipes with everyday ingredients you can find at any supermarket. Food network publish many such recipes. Would like to see more video content. Don't love the app but the magazine is awesome. Very awesome. I like the digital way better than the hard copy and it's even better on a IPad! Clunky, page loading is horrible, and it’s a step backwards in user experience. Miss the old table of contents. Now it’s just ugly. It doesn't work well on any of my mobile devices! The border on top and bottom is useless and detracting. I am also not able to view more than 2 pages in a row. I have numerous friends with same issues and unless this is fixed by next edition we will all be cancelling subscriptions and NOT buying print edition. If I could give zero stars I would. As others have stated, with the latest update I lost my subscription and previous issues. However this is the 4th time this has happened. After 3 weeks customer service agreed to convert back to print version. Still previous versions are lost. I won't be renewing print or digital versions. The new update is awful. Slower and more ads. Change it back please. So my app updated. Hopefully that solves the scrolling problem within my issues. I tried to restore my iTunes purchases with the update. No such luck. It still tells me I need to pay for previous issues. Come on food network....get it together!!!! With the latest app upgrade I lost access to previous digital editions that were included with my subscription. I have subscribed to both print and digital versions unlike what is noted within the app. I now have to pay to unlock previous editions. Not cool. Please fix. After a few days of communication with customer service, my subscription has been restored and I was even given a few other issues a no charge. Thank you! Update! The new update is AWFUL! I've lost my subscription. Fix this now! I'm only allowed to view issues I've already purchased as a "free" 5 minute preview. I will not renew when it's time. I'm not thrilled. I can't get it to work on my iPad. I've done everything the app tells you to do and it's still not working. I called customer service, the guy was nice but couldn't figure it out so in 1-2 days I'll hear from a manager. Like other reviewer's here, I have been a digital subscriber for a few years. Recently all of my issues have disappeared and my renewal through Amazon has not been recognized. I don't want to spend multiple days dealing with customer support to try to get back what I already had. I will be canceling my subscription. Hate the new version. Will not renew. Should have left it alone! I really hate the new update. If the page is touched in the wrong place, it goes to a listed index. It doesn't scroll correctly. Terrible. The sad thing is, the previous iteration was wonderful. I've been a digital subscriber for more than two years. The latest update is hard to navigate, can't easily read and save recipes, moving around is not intuitive. Why oh why do the developer trolls feel the need to fix what isn't broken!? Fix it back!!! Update 7/17/17: I still don't have access to 3 of my previous issues. Still requiring me to pay for them. Don't know why they decided to update the app, was working great before. DO NOT UPDATE!!!!!!!!! With the current update, I am now required to pay for issues I already had paid for. I have been emailing everyday asking for help with no response. I will continue to do so until this is fixed. This is needs to be fixed asap. DO NOT UPDATE!!!!!!!!!!! Bring back old format! Wishing I had stuck with print edition. Update: I have had nothing but problems with the digital content. The issues I have already paid for are now requiring me to pay to access the content. Customer service is terrible. I have not been able to find a phone number to contact them, and the back and forth emailing has gotten me nowhere. Very frustrated. I have lost all the recipes I used to have. Should have stuck with "real" cookbooks. I used to love this app until the most recent update. There is no longer the ability to make a "shopping list", which was one of the best features. It also used to read more like the actual magazine, with each page being uniform in size. Now you need to scroll down on some of the pages, but not on all of them. As a result, some recipes don't fit entirely on one screen, which detracts from the apps practical use while cooking. I agree with previous reviews; this app has serious issues. I paid for both print and digital but it won't let me access the digital. Wasted a lot of time on this and I have just given up. Tried all of the suggestions from customer support and none of them work. I don't like the new layout. It's like a bunch of websites now. Pages load very slow and I really dislike all the scrolling as it's very clumsy. I won't be renewing my subscription. I paid for subscription and I've lost all my previous content. WTH!!!! Unable to log on at all. You will lose any previously purchased magazines even with an e account. They want you to pay in order to access them. I wish I could give no stars as a rating. I bought a subscription, but after the update I cannot log into my subscription. I've tried deleting the app and reinstalling. I've tried contacting support and haven't heard back. What a rip off! Update deleted my account. Like other reviewers the magazines have a price on them. When I try to log in it says wrong email or password. When I try to reset the password it says that I don't have a subscription with that email. The app needs to be fixed! The new update is horrendous. All of my downloads are gone. Then when I finally get them to reload I can't view seamlessly. Every page takes 30-45 seconds to load. Completely terrible. So, so upset. Like with the HGTV magazine I had an active one year subscription and all issues were purchased. The update comes making the issues unreadable and it proceeds to delete all of my issues! No way to restore them and the support is useless! I had no problem cancelling my subscription though. Worst app ever thanks to Maz! Like the other MAZ powered apps, can’t get past the cover on previous purchases that need to be downloaded again. In addition, I hate the top and bottom banding which removes a full inch of actual content. Hearst Magazines better get on these problems or they are going to lose a lot of subscribers. I’m tired of having issues ever time iOS is updated. The app has changed so much over the years. I am not able to even use it anymore and i have just renewed recently and I have an iPad Pro. Ridiculous. Yeah, so where’s our January 2018 issue? It’s already 01/08 and still nothing! Agreed with previous reviews about the app update being garbage. I actually thought it might be my iPhone or iPad that was acting up but glad to know it was the shoddy tech. Mostly...WHERE THE HELL IS MY JANUARY ISSUE? This is crap. I have not received my January issue to download. I have been getting the run around about who is responsible for this but no answers and no January issue. Even then my December issue, the first 15 pages were all advertisement. I would not recommend this magazine to anyone and am very disappointed.